CLICK here for high resolution printable trail map (999 KB). 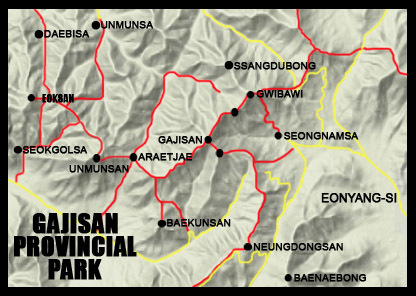 Gajisan Provincial Park is located between Miryang, Ulsan, Cheongdo, and Gyeongju, about 90 minutes north of Busan by bus. The mountains are part of the Baekdu-Daegan Mountain System and are popularly referred to as the Yeongnam Alps. A Korean tourist website for the park boasts that the “balanced beauty and heroic feature (sic) are greater than the Alps in Europe.” Though it’s probably hard to take such a strong claim seriously, these mountains are very beautiful and definitely worth some exploration. At the top of Gajisan--the highest peak--you can look north over a tumbled landscape of mountains reaching into the distance. The northern portion of the region includes Gajisan (1,240 m) and Unmunsan (1,188 m) peaks, as well as the famous rocky points, Ssalbawi and Gwibawi. There’s nothing here that warrants multi-day hikes, but there are lots of options for half or full-day excursions. (1) Take an intercity bus from Nopodong Terminal to Eonyang Terminal and tranfer to a local bus for Seongnamsa (25 min). (2) Take Busan City Bus #12 from Beomosa Subway Station, Yangsan City Hall, or Dongnae Lotte Department Store. It runs all the way to Eonyang Terminal, but because it makes frequent stops, it takes longer to get there. Once in Eonyang, you still have to transfer to a local bus for Seongnamsa. There is a good selection of motels and minbak not far from the Seongnamsa parking lot, where the bus drops hikers. Head down the main road back towards Eonyang. It’s a 10 minute walk. As usual, bargain with the proprietors. A typical minbak should have clean, simple rooms for a single person for around W20,000 (W30,000 for two people). There are a few ratty restaurants and a row of identical convenience stores in the Seongnamsa parking lot, but not many other choices for food. Seongnamsa stands just below the main ridge at Gajisan. Though small, I found the temple complex to be one of the most visually satisfying, perhaps because of the influence of its residents. The temple is occupied entirely by nuns. Important relics include a round stone tower, which contains the remains of the temple’s founder, and a 3-tier stone pagoda. If you go there in the evening, you can witness the prayer ceremony, where dozens of nuns sit together facing the primary prayer hall and chant together as the light fades from the sky. It happens around 6 PM.